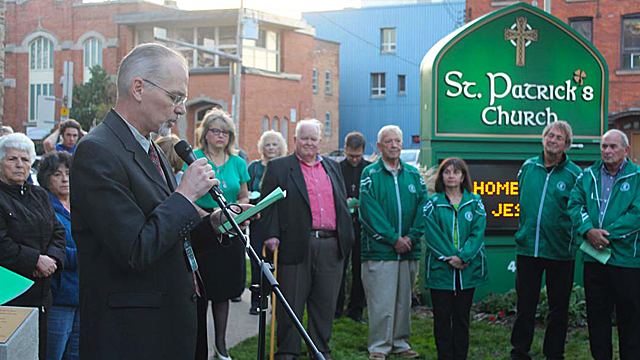 After months of patient planning and preparation, two new statues have finally been unveiled in the front yard of St. Patrick Catholic Church in Hamilton, Ontario. The bronze sculptures of St. Patrick and Jesus as a homeless man, now stand in what has been dubbed the church without walls. At the ceremony, Father Tony O’Dell, OMI, pastor of St. Patrick's, shared a comment from Pope Francis about the role of the church. The sculptures were in place and undercover for over a week. They were made public at a gathering on October 7, 2015. Bishop Douglas Crosby, OMI, Bishop of Hamilton, Father O’Dell and and Father Jarek Pachocki, OMI, pastor of St. Patrick's, were there, along with the internationally known artist who created the statues, Timothy P. Schmalz. 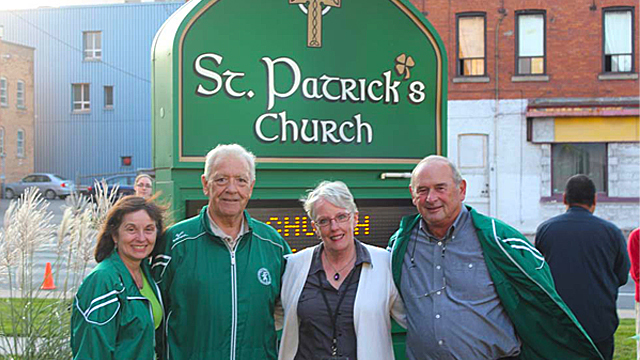 Schmalz says his inspiration for St. Patrick came from his visits to Ireland. The statue is in the shape of a Celtic cross, with the Irish Saint front and centre. “This sculpture of St. Patrick does what the Saint did throughout his life. He used the shamrock to explain the Trinity. The work is a blend of Catholic symbols and Celtic design inspired by the Book of Kells” says Schmalz. On one of the branches of the cross Schmalz designed a hand, carved as a symbol of God. On another branch, a fish, representing Jesus. On the third branch, a bird, the symbol of the Holy Spirit. At its centre where all branches meet, is the shamrock, the emblem that in this case unites all of them into the Holy Trinity. “If you look at the back of the sculpture there is the tree of life which is shared by both the Celts and the Christians in their history and symbols. The evil serpents on the bottom, they are symbolic about how St. Patrick removed violence and chaos and hatred from the island,” says Schmalz. Schmalz goes on to says that he hopes that people will come, stop and ask questions and he says the location is perfect for that. 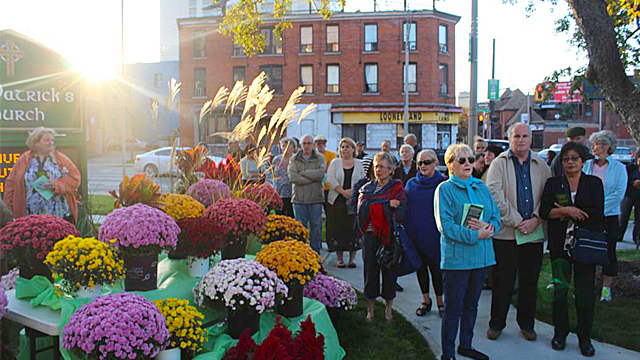 “I love the location of it because it’s kind of welcoming Christianity to this whole community,” says Schmalz. 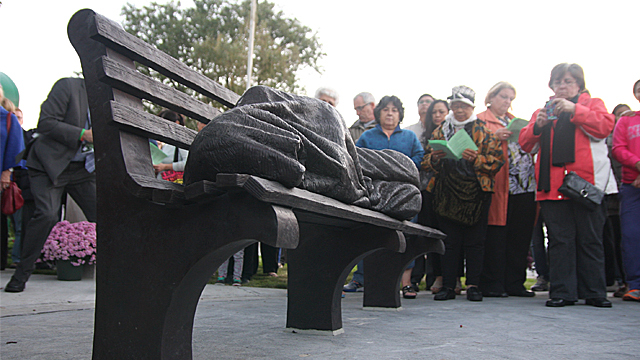 The Homeless Jesus statue, was inspired several years ago when Schmalz was in downtown Toronto in November. He had come across a homeless person on a busy street. He was sleeping lying down, his whole body shrouded with this blanket. In that moment says Schmalz, he thought, it was Jesus. A bone chilling experience that he says stayed with him for quite sometime. An experience, that he hopes those driving by will take in, even if not at first. After the blessing of both statues, Bishop Crosby, told the crowd that Jesus knew what it was like to be weak, to be poor and to be broken. “Jesus knew what it was to be bullied, to be falsely accused, arrested, abandoned, condemned to death, imprisoned and executed. “The statue," says Crosby, "challenges us to reach out to those who are suffering." A while back, Father O’Dell was presented with a challenge. He came across a man who had lost his way. He was in pain and suffering a great deal. He had, in the middle of the night, gone to the church seeking solace and comfort, but the doors were locked. Despite that he laid across the entrance and slept, knowing somehow he would be safe. Morning came and he recounted his story to Father O’Dell, who reassured him that here is a place where people can find comfort and solace. And so the idea of opening up and creating a church without walls began to bubble. The grounds were prepared and the statues were purchased and installed with the help of several donors. They now sit in the green space that surrounds the church. They've turned what was once a patch of grass, into a place where anyone can come and sit in the quiet reflection of prayer at anytime of the day. Like its title says, the church without walls has no heavy doors that can be closed and no giant bolts to lock.